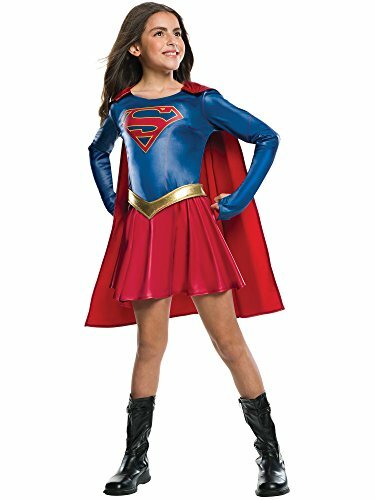 DC Comics costume dress in Wonder Woman or Supergirl prints for playwear, cosplay, dress up or Halloween. Super Hero glitter logo on front, metallic gold trim at the waist, pullover style, crew neck and short sleeves. The dress is approximately knee length with skirted layer of sparkling tulle. There is a detachable (Velcro) cape. Machine wash cold with similar colors, inside out. Tumble dry low and remove promptly. Do not iron decoration. Toddler and Little Girl sizing for approximate ages 2 to 6 years old. May run small. 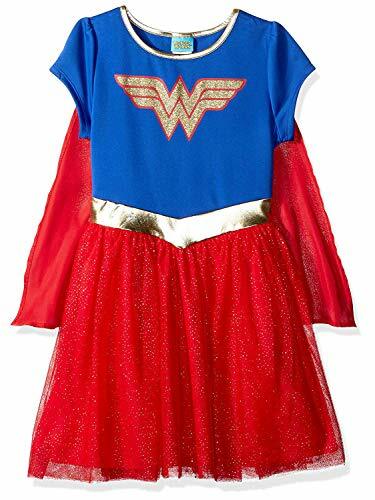 DC Comics costume dress in Wonder Woman or Supergirl prints for playwear, cosplay, dress up or Halloween. Super Hero logo on front, metallic gold trim at the waist, pullover style, crew neck and short sleeves. The dress is approximately knee length with skirted layer of sparkling tulle. There is a detachable (hook-and-loop) Cape printed with Superhero logo. Machine wash cold with similar colors, inside out. Tumble dry low and remove promptly. Do not iron decoration. Fighting crime doesn't mean giving up sparkle and style! 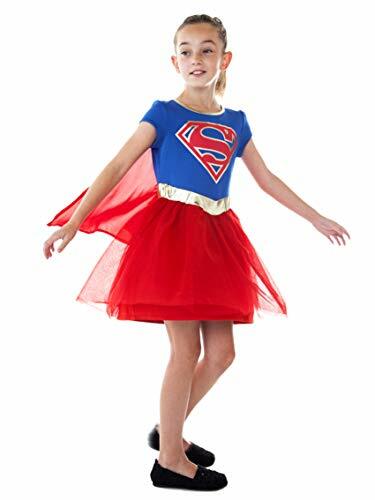 With Rubie's DC Comics deluxe hooded costume dresses, girls can play as Batgirl, Supergirl, Wonder Woman, or Robin. Get all four for group costume fun! 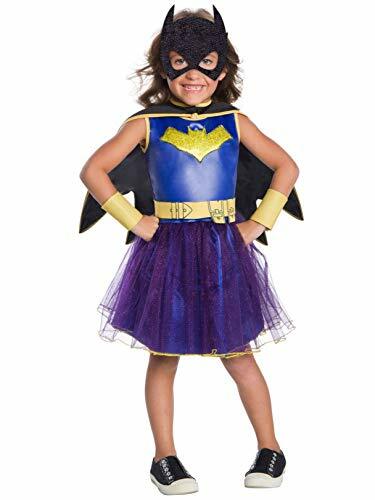 This Child's Batgirl costume hooded dress with attached cape, glovelettes, belt; black eye mask included. Children with long legs may prefer to wear dress with tights or leggings. IMPORTANT: Costumes are not sized the same as clothing, consult Rubie's Child Size Chart and recent reviews; DO NOT buy based on age or clothing size. 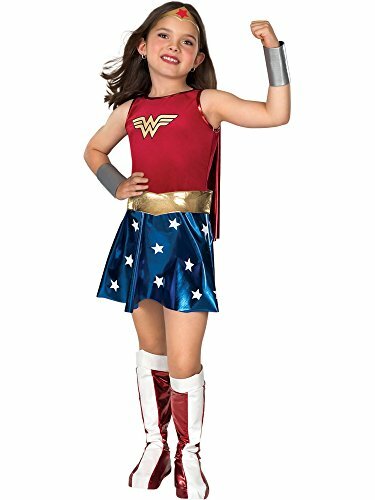 This is an officially licensed DC Comics child's costume, look for trademark on label and packaging to help assure you've received authentic safety-tested item. 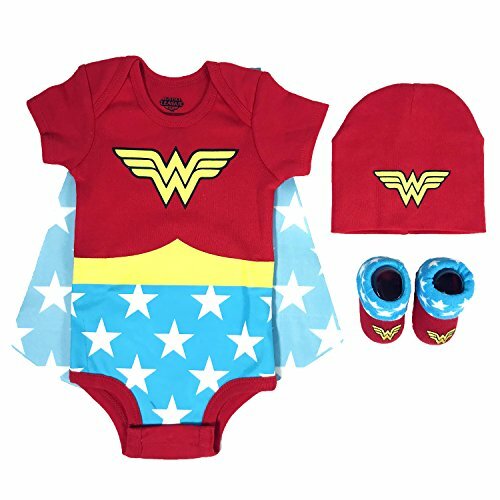 Look for DC Comics hero and villain costumes in sizes for babies, children, adults, and even pets to create your own super group of heroes! 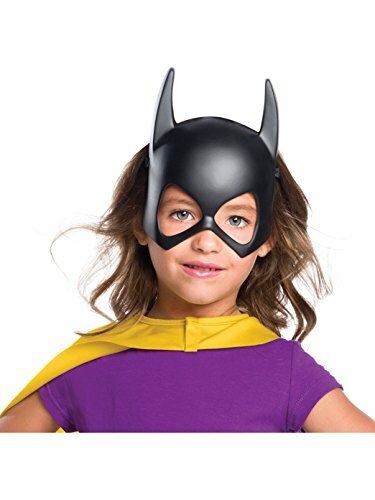 Officially licensed DC Comics Batgirl costume mask. NOTE: costume sizing is different from apparel, be sure to review the Rubie's Costume child's size chart before selecting best option for your child. Rubie's is in business and stocking product 12 months a year; a leading innovator in the industry, Rubie's has the broadest product line of any costume Company. Rubie's has more than 2 million square feet of office, development, warehouse, and production space. Products are manufactured all over the world, with approximately 35% of annual sales produced in Rubie's owned us factories. Same family ownership since the beginning in 1950. 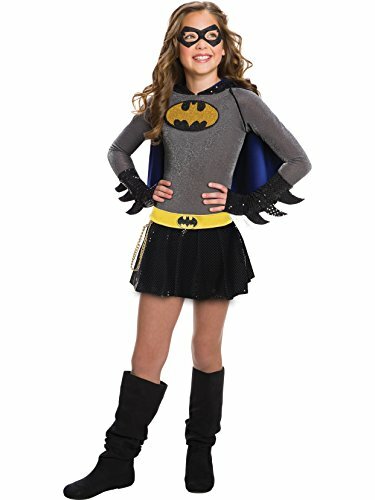 Officially licensed deluxe DC Comics Batgirl costume. NOTE: costume sizing is different from apparel, be sure to review the Rubie's Costume child's size chart before selecting best option for your child. Rubie's is in business and stocking product 12 months a year; a leading innovator in the industry, Rubie's has the broadest product line of any costume Company. Rubie's has more than 2 million square feet of office, development, warehouse, and production space. Products are manufactured all over the world, with approximately 35% of annual sales produced in Rubie's owned us factories. Same family ownership since the beginning in 1950.